Another three bite the dust! It’s been a really good week here in the studio on almost every front (hey, nobody’s perfect). We have a lot to talk about, especially for a “off” week (next week’s update will include User Stories), so let’s get this started. Use seeding system to create nodes/farms of minerals – The first pass of this is complete, and has gone through some initial testing. This is a work-in-progress, but right now, it works, and will have future expansion during Beta 1. First pass inventory system, including encumbrance penalties – We’ve had a working inventory system for some time, and we need to set up more functionality around encumbrance. For now, we’re splitting off encumbrance to its own line item, and checking off “inventory system.” There are still more features and possible performance issues we’ll want to hit later. Encumbrance was hitting several systems, so it’s still in the queue as a Beta 1 item. Plot ownership, access permissions, change of ownership. – We waited to check this off until we updated the older code to work with the newly-minted ability system. We’ve also updated buildings with Brad and Rob’s work this week, and have only encountered a small number of bugs, so far :). The good news is, we actually have more functionality in plots than we had originally planned for Beta 1, such as: the build queue, the concept of “contested” when trying to take a plot, as well as a speed-up in build time when someone of your Realm is within the plot bounds with you. Expect more in the future, of course, but what we have, as of today, meets our expectations for Beta 1. As always, we will be honest with you folks about the checklist. We’d rather wait a little longer to check something off rather than do it too soon and backtrack from that afterward. We had to do that with the ability system, and we have no intention of repeating that mistake. The kinda tropish, but true, saying that “nine women cannot make a baby in one month” is very true. In our case, because we are using our own engine, and we are doing some very non-trivial things, it takes longer for engineers to get up to speed on it than if we were using Unity or Unreal. OTOH, even now, some of the things we can do with our engine already set it apart. Building an entire client/server engine is hard, and we’re a small team. We’re not complaining, mind you, we knew what we were getting into. However, the fact remains that for a programming team whose size just reached the double-digits, making a game like the one we are making would already be difficult. Making an engine at the same time is, in the eyes of many of our industry colleagues, a ride on the crazy train. Well, we are on that train, picking up speed, and we can see the next station in the distance, as per below. Our pace is starting to pick up nicely, as not only do we have two full-time gameplay engineers, but other engineers are being tasked/helping out with more gameplay-focused items. I don’t want to riff on my catchphrase from the WAR days and say “Beta 1 is coming,” but the truth of the matter is that it is indeed coming this year. As we’ve said before, once Andrew’s new animation system and George’s improved VFX systems are in place and working as needed, we will have a lot more clarity on the release date. During game development, things change a little bit, sometimes even more than a little bit. Sometimes it is for the worse, sometimes the better. In this case, we’ve added two more items to the Beta 1 Extended list that are both important and needed for going LIVE. These two items are almost done, and therefore we can say with complete confidence that they did not, in any way, delay Beta 1. In all likelihood they accelerated our push, because we solved problems that we would have had to deal with eventually, anyway. Fortunately, we solved them ahead of time. Improved VFX rendering system – When we did the original push to Beta, we were using a fairly rudimentary system that Andrew threw together in a couple of days. We knew that this was a placeholder system, and that we would be replacing it down the line. As our numbers during Bot tests climbed to 2K, it was clear that we should look to replacing this system sooner, rather than later, so we could handle that number of players with VFX, even during Beta 1. Thankfully, we had since hired a very strong graphics and client engineer in George. Along with all the other work he’s done to improve not only our visuals but our performance, he’s had time to re-work our VFX rendering system to support the scale of battles in CU. This work is nearing completion at this time, as George works through bugs and fun graphics card driver crashes! Physics updates running on its own server – Moving into our initial Beta push, we had several discussions concerning updating buildings, and whether they are being built or destroyed concurrently with the main game update thread. This could manifest as occasional lag during large amounts of destruction, or simply running around an area with many players building on the scale we are planning to support. With the hire of Colin, a strong networking engineer, we’ve had the time to actually move many of our physics updates to their own server. This is nearing completion as well, and will soon be ready for testing. This will also give us overall better performance than our Backers are used to now, and especially for the opening of Beta 1. Not bad, not bad at all, eh? Three items off the list, two new ones added that are almost complete, and we might have another one that is also near completion. As I said on the Forums, step by step, feature by feature, we slowly but surely build the game and engine to deliver on our Kickstarter promises. For today’s Top Tenish list, we have a few nice wins again this week. WIP – Tech – Improved Animation System: Andrew hooked up death animations this week, as well as flinch animations that are synced to skill hit timings between server and client. This is a fairly big deal to us in terms of what makes the animation system “feel good.” Currently, he’s working on separating casting vs. melee animation types, and giving Ben the ability to assign them himself, instead of having an engineer do it. WIP – Tech – Buildings: The TL;DR is that we’ve merged a lot of work on buildings into the main game! Right now, the goal here is to ensure things are behaving the same as they did before the update. Moving toward Beta 1 and beyond, completing this work allows us to focus on performance improvements and stability, without having to do it all again differently to support different types of curved surfaces (which we plan to support after the start of Beta 1). Brad and Rob are currently making steady progress on bugs and performance issues, and it’s a testament to their skill how smoothly this large change has gone, so far. WIP – Tech – Manual aiming: Remember the bit of testing we did on this with the old ability system? Matt is currently updating this code to work with the vastly improved ability system. As before, our goal is something fun but flexible for Beta 1. We fully expect this system will go through several revisions once it is ready for testing. WIP – Tech – Banes and Boons UI: We finished up the bulk of the UI work using a simple mockup for a Beta 1 first pass. We’re waiting on a code review to get things hooked into the UI. Once Matt gets in a pass on aiming for abilities, he’ll come back around and drop in some additional functionality work, so we can begin adding in more complex types of Banes and Boons. James K. also started creating icons for the Banes and Boons. Note that the icons and UI styling are not indicative of our final UI styling! We know this will continue to change, which is why our focus is to keep it simple for Beta 1. WIP – Tech – Guild UI: JB is nearing the end of his work on a Beta 1 version of guilds, with a working Beta version of the UI. We’re shooting for bug fixing and preliminary testing next week. WIP – Tech – Fast Entity Reader: Colin completed support for players, items, and dropped items last week. This week was code cleanup to reduce duplicate code in order to improve long-term maintainability and decrease the possibility of bugs, going forward. WIP – Tech – Bots: After getting Bots (headless PC clients) to use abilities last week, and moving our per-server number up to 350, Marc has continued to progress, possibly getting 500 Bots on a single server! This is up from our initial 120 per server that we had last year. Why should you care about this? Well, by having 500 Bots on a single server, we reduce our costs on running Big Bot Battles, tests, and even more importantly, we can run long-term stability tests on our engine without spending a fortune (we LOVE AWS, but it’s not cheap). To be clear, this is in no way related to total amounts of players on a server, but is about the number of Bots being run by a server. Art – Textures: Tyler gave Cross a new toy (Megascans Studio), and he’s currently creating really nice terrain textures for current and future use. 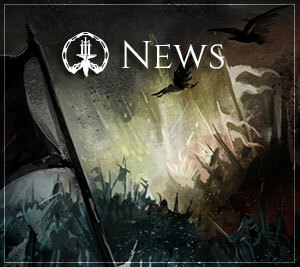 Art – Weapons: We originally hadn’t planned on unique polearms for each Realm for Beta 1. With the added time we had, Michelle knocked out some concept art for the TDD polearms. We’ll be creating and adding them in soon, as well as adding in Viking versions which have been completed. Art – Place of Power: As with the character art, we got pushed back a couple of days here. So, this week, we took that downtime to improve the surrounding six statues of the PoP to just plain look better, using unique materials. Cross also started concepting out the VFX and materials on the crystals, once we got them in his hands. To our German and/or German speaking Backers: The update for the site is complete, but it still needs final review. We had to push this back to next week, simply because this week was very focused on Beta 1 work. Apologies for the delay, Tyler will try and get this finished up next week. Once again, another great Top Tenish list. 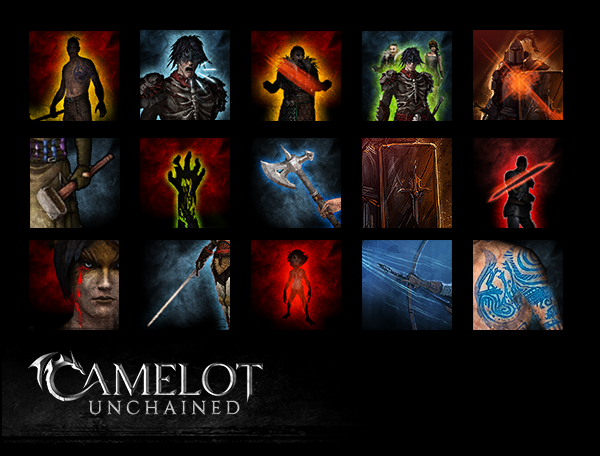 As you can see from the list’s items, more and more gameplay is being focused on and delivered by the team. And more is coming, lots more. As usual, let’s take a look at some great stuff from the Land of Art, Animations, and other Purty Stuff! First up, a polearm animation image. 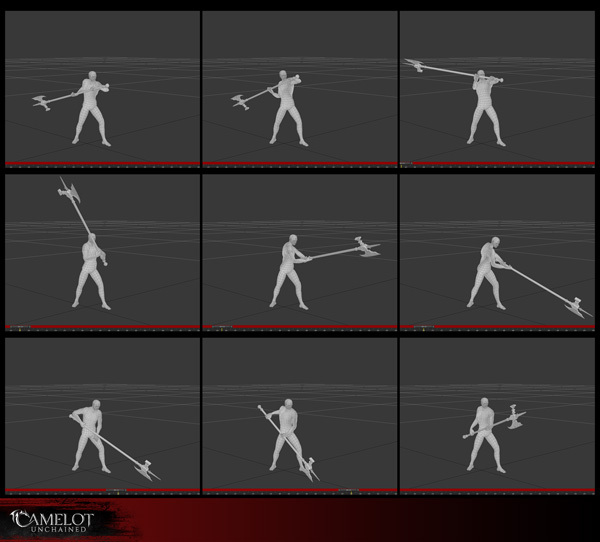 This is a selection of key poses from the polearm animation work. As you can see, this weapon type is very different from a spear or sword, and adds more breadth to the types of weapons you can use. Here are raven and lion statues for the game. We took a quick pass on updating the statue materials in the Place of Power. This treatment had a short learning curve that we quickly fell in love with. 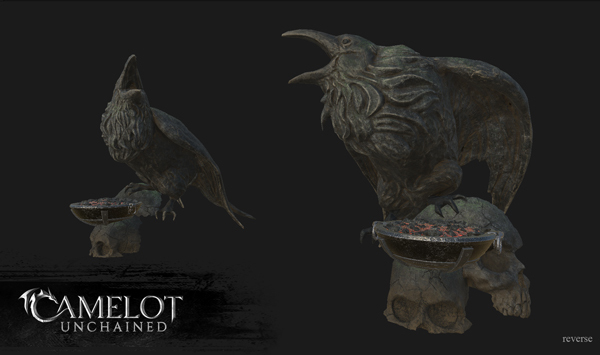 What was learned here will inform the polish pass of the Place of Power materials, as well as future environment art. (These shots are within the material editor.) 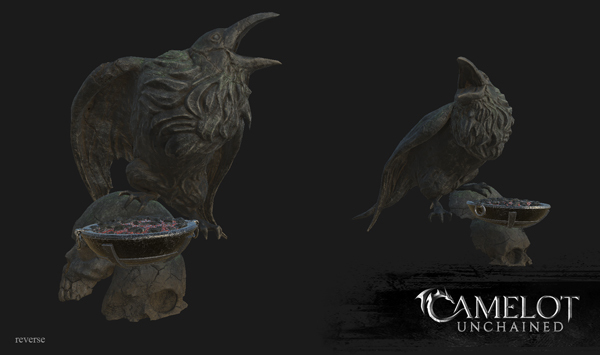 First up, the raven statues. And now from the opposite angle. And what did the raven say to our next guest, right before dinner? Nevermore! Speaking of materials, why are they like ogres? Because they have layers! Per our top ten, Mike is working with a series of physically based surface scans (like the PBR system in our game), and mixing them up to create terrain assets that will be easy to audit in the future, in order to add a bit of CU styling on top. 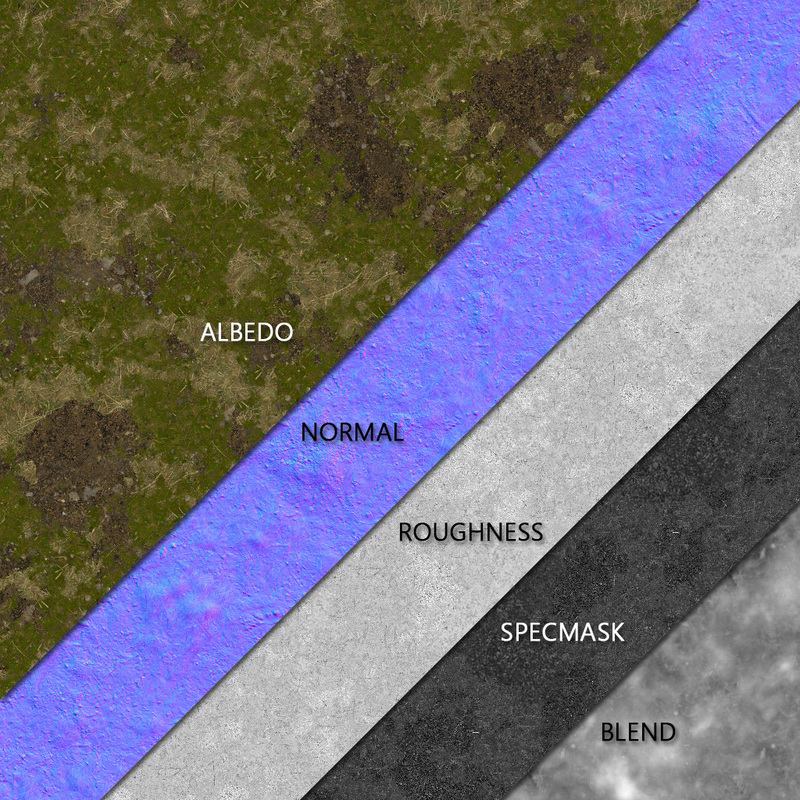 The image below shows the different maps we use in our terrain materials. The albedo, or color layer without lighting information, is first. The normal defines how light behaves across the surface, defining the much smaller surface details. This map is technically pretty old school at this point. 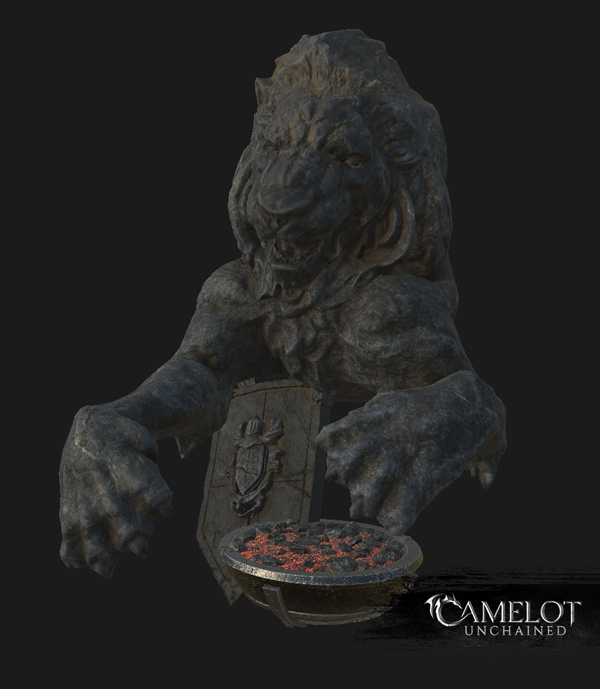 The roughness and specmask are part of our PBR (Physically Based Rendering) update. While not necessarily a very new concept, the PBR use is still not widely adopted in the gaming industry. The roughness map defines how rough the surface material is. Who knew? Simply put, this defines how spread out the light is across the material, and how smoothly it blends into the shadow side. Dirt is very rough and has a very wide highlight, while a crystal would have a very tight highlight. The specmask defines how bright the highlight is. Those last two really help us visually differentiate materials from one another. The final black and white texture at the end is a recently introduced height map, which we are using as a “blend” map, with white being higher in vertical distance than black. We use this to more accurately blend materials in the terrain together. The introduction of this map may allow us to do some fancier shader techniques at a later date. Once we start adding these new materials to the game, we’ll get some side-by-side shots for you folks. It’s only fitting that since we led this section with some polearm animation tidbits, we should show off some concept art for the weapons that will use those animations. 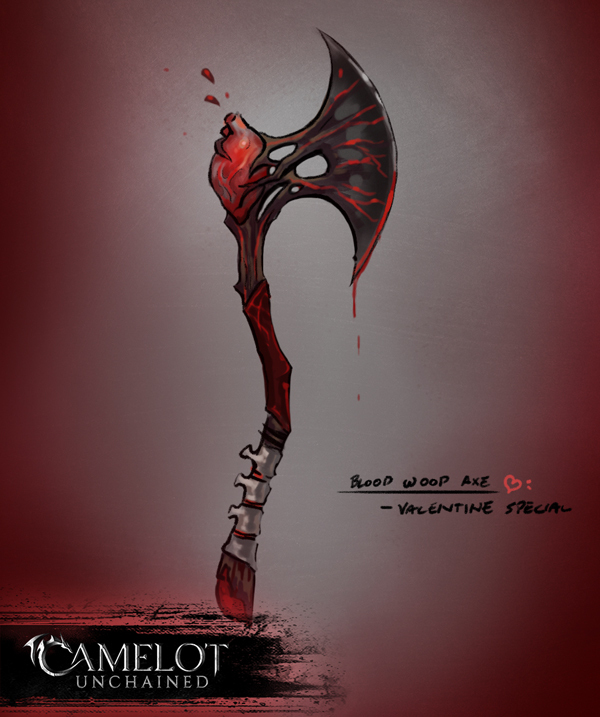 Michelle gave us the difficult task of picking our favorite TDD polearm designs from this concept art. Typically, we pick the hardest one to create so we can vet our process. However, since we’re good on process at this point, this will surely be a “that one is awesome” type of discussion. There will not be an Alpha test this weekend, as we wanted to focus this week on landing all the things covered above. As such, while we got a lot of things in, this current build is definitely not ready for Prime Time, but I expect that will change for next week. No promises, but I’m hopeful that next Friday we’ll be able to open the servers for some serious testing.